My first real experience of Halloween came during my time as a student at Ottawa University back in the 1990s, when my Canadian friends took pity on a poor uninitiated Brit and introduced me to what is truly an unmissable event on the North American calendar. Every shop has a vast array of costumes to choose from, porches are adorned with carved pumpkins galore, houses are bedecked in lights and decorations to rival those put up for Christmas and entire neighbourhoods take to the streets on the night itself, pillowcases in hand, to offer the traditional “..trick-or-treat..” to the eager participants. Likewise, G and M have fond memories of their own Canadian Halloween experiences with cousins and friends and their outfits are still hanging up in M’s costume wardrobe as a permanent memento. It was, understandably, a big part of Mike’s childhood, but is not an occasion I ever remember marking in my own upbringing and at home, here in the UK, I can’t quite reconcile myself to the idea of sending my children out in their ghoulish fancy dress to knock on random houses in our village to ask for treats, when, for the other 364 days of the year, I’m drilling into them the mantra to not accept sweets from strangers. Whilst we might not be avid Halloween fans in our household, I know it is a custom that is becoming more and more popular around the country. Of course, for children with food allergies, trick-or-treating takes on a whole new meaning as frighteningly they risk their health by collecting sweets that could unwittingly trigger an allergic reaction. This year in particular, I am glad that my children have no expectations of going out on Halloween as with M’s slim pickings when it comes to safe foods, I would have to take away every single sweet he was given and swap it for a M-friendly alternative; and would have to do exactly the same to protect G from her allergies too. 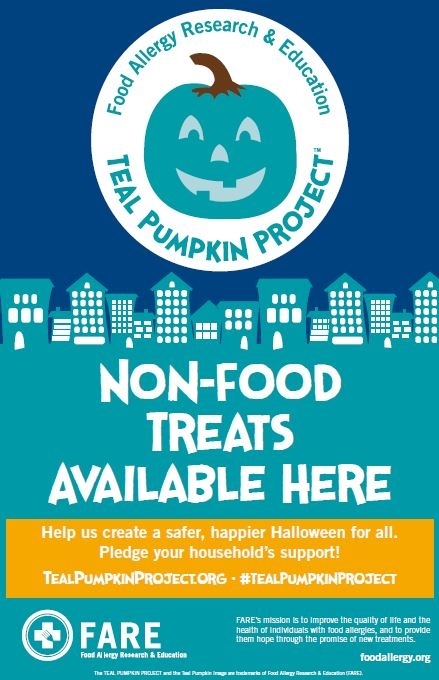 However, thanks to Food Allergy Research & Education (FARE) in the USA, a relatively new campaign helps raise awareness of food allergies during Halloween season, seeks to ease parental concerns, promotes inclusion of all trick-or-treaters and asks households to pledge to participate in the Teal Pumpkin Project™. 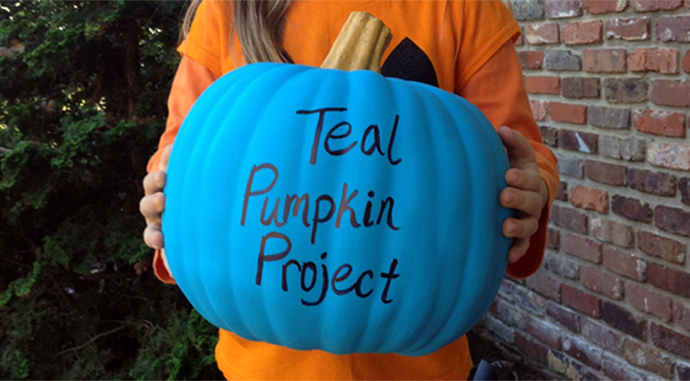 This national campaign was launched in 2014 and saw households from 50 states and 7 countries get involved in the Teal Pumpkin Project™ and FARE is hoping that this year an even bigger movement will happen with a target 100,000 households pledging to take part. The idea is simple and incredibly effective: if a household is prepared to provide non-food treats for any trick-or-treaters likely to call, they are asked to paint a pumpkin teal and place it in pride of place in front of their home. Their website also has a free printable sign to indicate there are non-food treats available, which can be downloaded here. Even though this initiative was originally launched in the USA, the project has gone viral through the various social media platforms and allergy parents around the globe are making the pledge for this October 31st. And remember, your involvement could make a big difference and ultimately save the life of a child like M.
This entry was posted in Food Allergies, Parenting, Special Needs Parenting and tagged allergic reaction, Allergy, Awareness, Conditions and Diseases, Education, FARE, Food, food allergies, Halloween, health issues, ill health, North America, October 31st, parenting, pumpkin, Special Diets, Teal pumpkin project, trick or treat, trick or treating, USA on October 26, 2015 by bluesingingdragon.